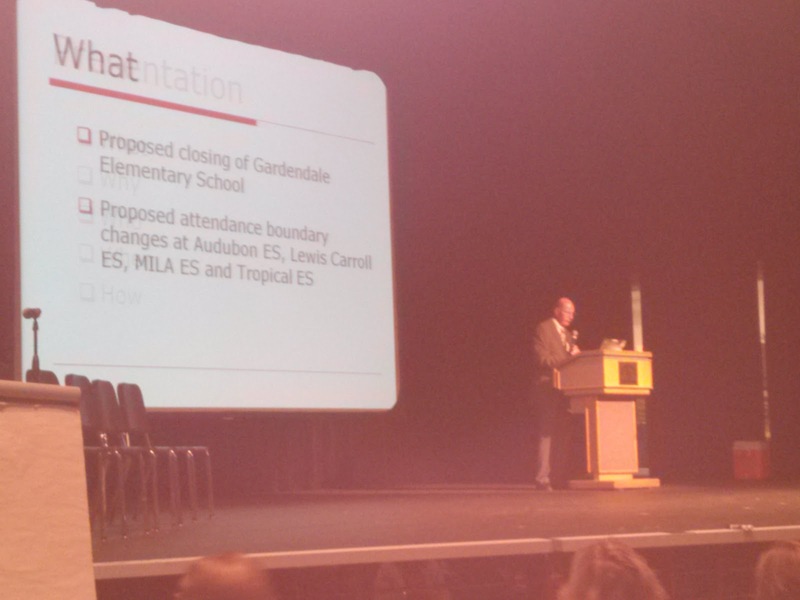 Brevard Public Schools officials hosted a community forum of 250 concerned parents on Monday night to explain the district’s decision to close schools – particularly Gardendale Elementary Magnet School. It was held at Merritt Island High School. Dane Theodore, Assistant Superintendent of Facilities Services, outlined the same capacity utilization plan that Dr. Brian Binggeli, superintendent of BPS, presented to the school board on November 20. The plan for the Merritt Island area can be found at http://www.brevardschools.org/fp-includes/communityforum/ProposedSchlClosings.html. Theodore said that closing Gardendale will save approximately $800,000 per year and that the savings from school closures will reduce impacts to other programs. “We’re going to have to close schools and eliminate programs,” he said. “We need $30 million to fill the void. “Is it better to take $3 million from four school closings or eliminate programs that will affect 40,000 students,” Theodore asked rhetorically. He noted that Gardendale has the smallest capacity, is central in Merritt Island, and has minimal 10-year capital improvement needs. There is also ample capacity is available at adjacent schools. Theodore added that since it is a magnet school, with students coming from outside of its district, fewer in district students would be affected by its closing. Parents also questioned why choice elementary schools, like Stevenson Elementary on Merritt Island, were not included in the capacity utilization plan. I am the aunt to two of Gardendales students. My question is this if there is such a deficit in the districts budget than would someone explain to me how a superintendent can make 200,000 a year when his performance for providing solutions to the budget is substandard? I have heard very plausible solutions to the budget problem come from family and staff that would save adequate amount of revenue but these suggestions had to come from family and staff. I think it is high time the superintendent do his job and earn the over inflated salary he deems he is so qualified for. If teachers must prove their worth by performance of their students I would expect the school board to do the same. Don't forget we also pay Harold Bistline's firm over $300,000 a year. In 2007 we paid his firm over $600,000. Even city attorneys only average $130,000!! !